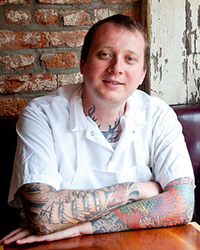 Why He's Amazing: Because from Battersby's tiny Brooklyn kitchen, he and his co-chef Joe Ogrodnek are turning out creative, market-fresh dishes that outshine those at many high-end Manhattan restaurants. How Kale Can Taste So Good: Some leaves are raw, others are flash-fried until crisp. They're all tossed with a dressing made with bird chiles, palm sugar, lime juice and fish sauce.